Graphene is a two-dimensional matrix of carbon atoms, which is arranged in a honeycomb lattice. Graphene composites are materials which are formed by combining two or more graphene materials with different properties to produce an end material with unique characteristics. These materials do not blend or dissolve together but remain distinct within the final composite structure. Graphene composites have several potential applications in various end-use industries such as electronics, building & construction, aerospace, automotive, energy storage & generation, and others (textiles, paints & coatings, health care devices, etc.). The global graphene composites market is anticipated to expand at a rapid pace during the forecast period driven by various factors such as significant rise in government-backed funding in research & development projects which is increase applications of graphene composites. Graphene composites are used in a wide array of industrial and everyday applications, delivering technological breakthroughs in areas ranging from electronics to energy storage & generation to aerospace and automotive due to their high thermal conductivity and high mechanical stiffness properties. Lack of adequate production processes of the materials is a key challenge faced by graphene composite manufacturers, which makes it difficult to produce a substantial quantity of graphene in less time. This acts as a restraint to the grapheme composites market. Chemical vapor deposition (CVD) is an extensively used technique for the production of graphene composites. It produces a monolayer of graphene directly onto a copper or nickel substrate. The other method used to manufacture these composites is exfoliation of graphene, which breaks all the stacked layers of graphite to produce graphene mono-layers. Hence, availability of only two methods for the commercial production of graphene composites inhibits the graphene composites market. Mechanical properties of graphene composites can be improved by incorporating graphene with polymers, using the advantages of graphene in mechanical reinforcement over existing carbon fillers such as carbon black (CB), expanded graphite (EG), and single-walled carbon nanotubes (SWNT). The global polymer-based graphene composites segment is projected to expand at a rapid pace driven by rise in demand for lightweight vehicles and applications in end-use industries such as electronics, building & construction, automotive, aerospace, energy storage & generation, and others due to its properties such as exceptional specific modulus and strength. In the last few year, graphene and its derivatives have been incorporated into a wide range of polymers, including epoxy, polystyrene, polypropylene, polyethylene terephthalate, and polyaniline, among others for various functional applications. In terms of revenue, North America and Europe are leading regions of the graphene composites market. The market in Asia Pacific is expected to expand at the highest CAGR during the forecast period, followed by Latin America and Middle East & Africa. 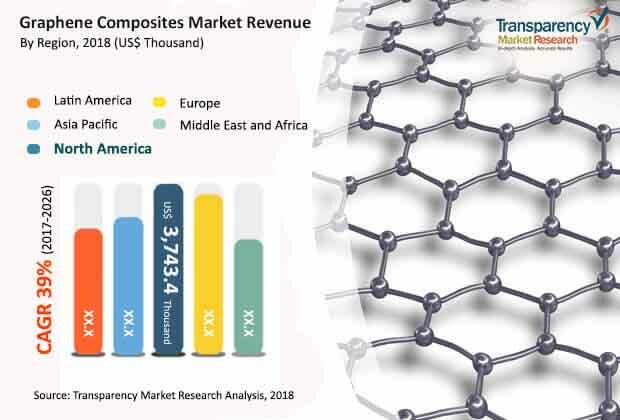 In terms of market capitalization, North America and Europe are market leaders and are expected to follow the similar trend in graphene composites market during the forecast period. However, the market in Asia Pacific is projected to expand considerably owing to shift towards using energy storage & generation practices due to depleting resources of energy. Additionally, rise in demand for electric vehicles is increasing in the region, which in turn, drives the graphene composites market in the region. The polymer-based graphene composites segment is anticipated to expand at a rapid pace, especially in developing economies in Asia Pacific and Middle East & Africa. The ceramic-based graphene composites segment is projected to expand at a rapid pace due to rise in demand for lightweight and fuel efficient vehicles. In terms of country wise analysis, the market in China, the U.S., and Brazil is anticipated to expand at a significant CAGR due to increase in demand from various end-use industries such as aerospace, automotive, and energy storage & generation activities in these regions during the forecast period. Key players profiled in the graphene composites market include Haydale Graphene Industries PLC, Graphene Nanochem plc. NanoXplore Inc., Applied Graphene Materials plc., XG Sciences Inc. , Directa Plus PLC Company, Graphene Composites Limited (GC), Graphene 3D Lab Inc., Graphmatech AB, Nano Graphene Inc., and PMG 3D Technologies Company Limited. Increase in production capacities, geographical expansion, and upgrades in existing solutions and offering are strategies implemented by major players. This report analyzes and forecasts the market for graphene composites at the global and regional level. The market has been forecast based on revenue (US$ Thousand) and volume (Kilo Grams) from 2018 to 2026. The study includes drivers and restraints of the global graphene composites market. It also covers the impact of these drivers and restraints on demand for graphene composites during the forecast period. The report also highlights opportunities in the graphene composites market at the global level. The report comprises a detailed value chain analysis, which provides a comprehensive view of the global graphene composites market. The Porter’s Five Forces model for the graphene composites market has also been included to help understand the competitive landscape in the market. The study encompasses market attractiveness analysis, wherein applications are benchmarked based on their market size, growth rate, and general attractiveness. The study provides a decisive view of the global graphene composites market by segmenting it in terms of product type and end-use industry. The segments have been analyzed based on present and future trends. Regional segmentation includes the current and projected demand for graphene composites in North America, Europe, Asia Pacific, Latin America, and Middle East & Africa. The report also covers demand for individual product type, and end-use industry segments in all the regions. Key players operating in the graphene composites market include Haydale Graphene Industries PLC, Graphene Nanochem plc. NanoXplore, Inc., Applied Graphene Materials plc. XG Sciences Inc., Directa Plus PLC Company, Graphene Composites Limited (GC), Graphene 3D Lab Inc., Graphmatech AB, Nano Graphene Inc., and PMG 3D Technologies Company Limited. Market players have been profiled in terms of attributes such as company overview, financial overview, business strategies, and recent developments. The report provides the estimated market size of graphene composites for 2017 and forecast for the next nine years. The size of the global graphene composites market has been provided in terms of revenue and volume. Market numbers have been estimated based on product type and end-use industry of graphene composites. Market size and forecast for each product type, and end-use industry have been provided for the global and regional market. In order to compile the research report, we conducted in-depth interviews and discussions with a number of key industry participants and opinion leaders. Primary research represents the bulk of research efforts, supplemented by extensive secondary research. We reviewed key players operating in various end-use industries, annual reports, press releases, and relevant documents for competitive analysis and market understanding. Secondary research also includes a search of recent trade, technical writing, internet sources, and statistical data from government websites, trade associations, and agencies. This has proven to be the most reliable, effective, and successful approach for obtaining precise market data, capturing industry participants’ insights, and recognizing business opportunities. Porters’ Five Forces highlight the potency of buyers and suppliers and enable stakeholders to make profit-oriented business decisions. They analyze the strengths and weaknesses to gain strategic position in the market.